Looks like I didn’t get the memo in time. The one informing me that nobody lines up for the iPad anymore. Well, to be fair, some folks still do – but judging by my friendly local Apple Store at a mall near my house the numbers are much, much lower than for any other iPad launch. How much lower? Well, on every previous launch day I’ve got out to the parking lot of this same mall at somewhere around 3:30 to 4:00 in the morning – and have been at least among the first 25 in line (sometimes within the first 10). But by store opening time at 8AM the line easily stretched into the hundreds for the first few launches. 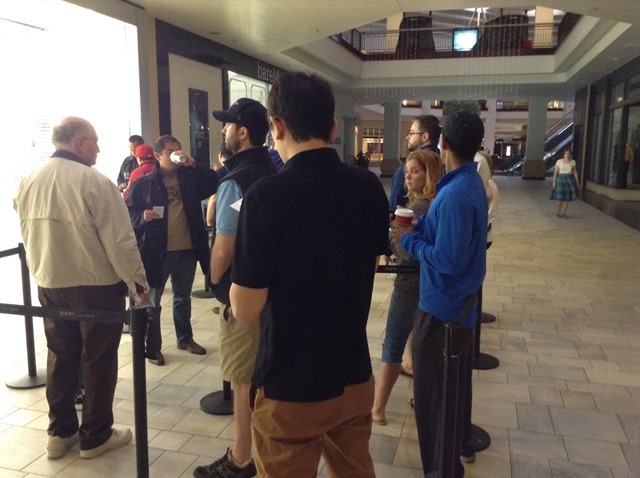 Today at 8AM there were 16 of us in line for the iPad Air. You can see this poor excuse for a line in my photo above. The line had tapered off for the iPad mini launch last year, but nowhere near as much as today’s tiny line for the iPad Air. It was a strange, slightly sad experience to see the Apple Store looking so empty a few minutes after the doors opened at 8AM. 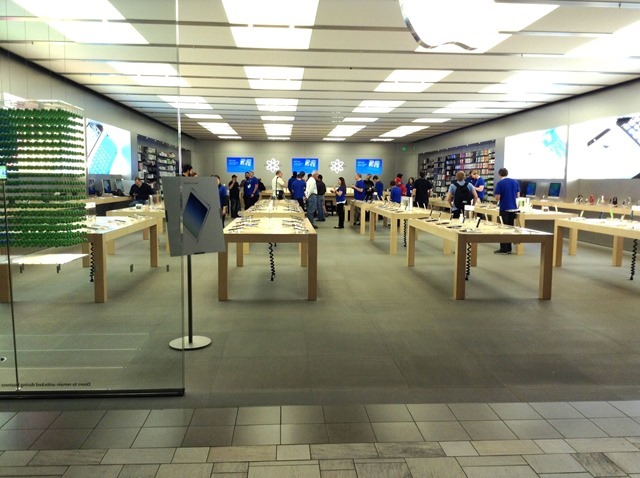 On past iPad launch days this store has been a heaving sea of people within just a few minutes of opening. It’s definitely the first time I’ve seen it look as if there are more Apple staff around than customers. And it only added to the odd feeling to see Apple staffers sticking with the queuing barriers to ‘manage’ the non-crowd – when they could easily have just said hello and let people enter the store as they would on a normal day. So when I say I missed the memo, here’s why. I went with my regular iPad Acquisition battle plan, got out in front of the mall at around 4AM. Not a soul around. I stayed around for an hour, reading news on my iPad mini and listening to terrible early morning sports radio. At 5 there was still nobody around so I went to the closest Starbucks, had a coffee and a bagel, took my time, and then went back to the mall – and found there was still nobody on line. At that point, I began to work out the memo for myself – finally. So I went back home for a while and didn’t go back to the mall until 7:45 – and I was still number 15 in line. I’m very lucky of course to have an Apple Store just 5 miles from my house. My failure to get the memo and regular battle plan would’ve sucked considerably more if I had a long drive to a store. 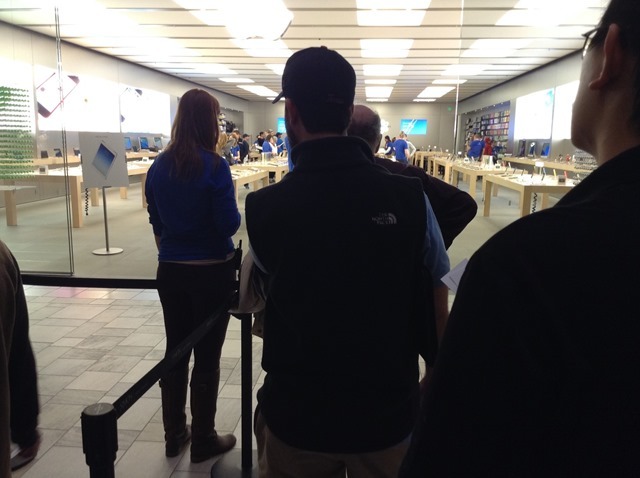 And it looks like the tiny line here at my local Apple store in Austin may be reflecting much shorter lines for the iPad Air in general. Fortune Tech reports today that the line at Apple’s flagship 5th Avenue store in New York is only 50% as long as last year’s iPad mini launch, and 35% of the 2011 iPad 2 line. Have any of you been out this morning to get an iPad Air? If so, what were the lines, or non-lines, like? I know you’re in Austin, where did “on line” come from instead of “in line”. I usually only here/read that from New Yorkers and Europeans. Really though, thanks for the report. I may run out at lunch and pick it up now. I bought one at the local Best Buy, and there was not a sole in sight buying iPads. Even the employees were a little surprised. I guess some of it could be because the store opened two hours earlier than normal, but still. Usually there has been a line outside waiting for the place to open when the iPads have been released. I don’t mind though because it was much easier for me to get in and out, and back to the house to load my new device! Well… I was also surprised. I went to 3 different retailers just to see if there was any hype was so ever over the new iPad. Walmart had no one interested in the ipad at all. Not a single soul in the electronics department. Best Buy was ‘ok’ . I mean they at least had customers waiting at the doors (30-35 people). The Apple Store however was a total failure. 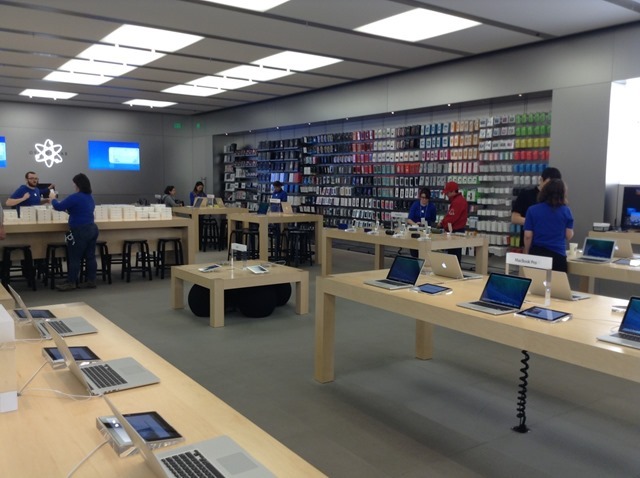 By the time I went there, around 10:50 am, the store had sent more than 6 employees home and by the time I was paying for my ipad I over heard that they had only sold 7 iPads! What!? Apple, it’s time to innovate . People are realizing that $500+ for a new iPad that does more of the same every year is nothing more than a waste of money. I stayed up until 2am. Ordered the iPad Air and selected “In-Store Pickup”. In the morning around 7AM I got an email saying my order was ready (I was still asleep). I eventually woke up, had breakfast and got to the store around 9am. The store was mostly empty (which shocked me). There was more police/security than customers. I think this is the first time ipads had the in-store pickup option on launch day? That might explain the queues….people could come in whenever they wanted to pickup their orders. I was in Tokyo, Shinjuku area, and there were still iPads to bought. No lines. 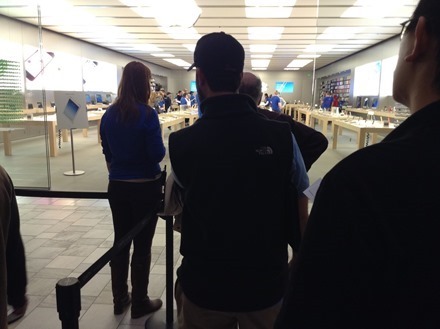 The line at my local Apple store in Houston was also quite short. Maybe 25 people at 8 AM. I was just there to look at the new iPad as someone else has said they are getting me one for Christmas. I must admit I like the new slimmer iPad Air, mostly due to its weight. Small line at my store in the UK but the ability to reserve one and the reports of large amounts of stock means no real need to line up. Small line on launch day at Toronto’s Eaton Centre too at lunch time, about 15 people, mind you come the evening the line was 40 people, nothing like the past launches though. Although this time around best buy, future shop and even chapters|indgio had them. I not fact future shop had no line and more sales staff than customers.